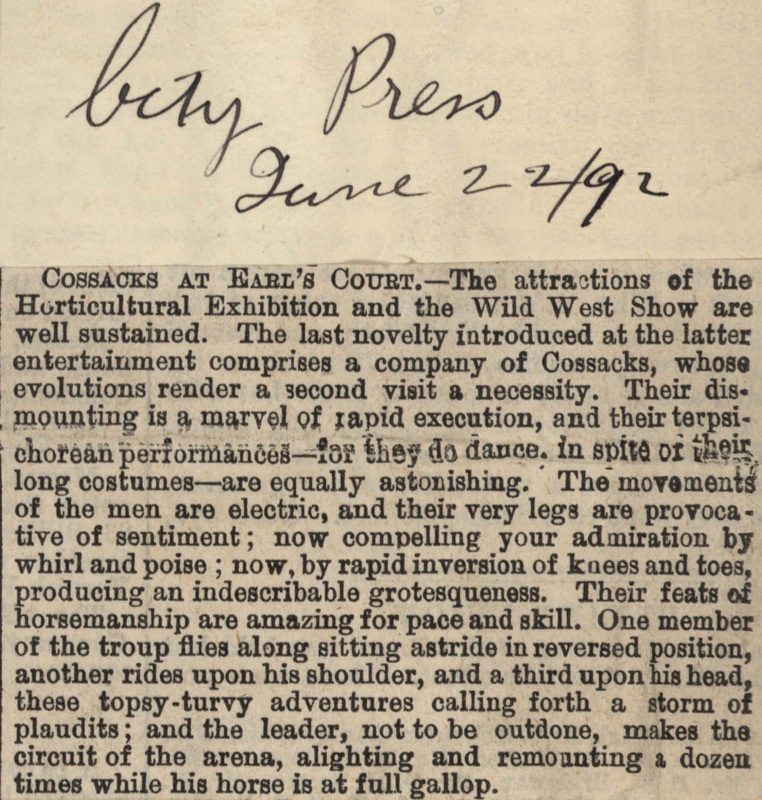 COSSACKS AT EARL'S COURT.—The attractions of the Horticultural Exhibition and the Wild West Show are well sustained. 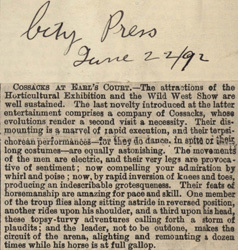 The last novelty introduced at the latter entertainment comprises a company of Cossacks, whose evolutions render a second visit a necessity. Their dismounting is a marvel of rapid execution, and their terpsichorean performances—for they do dance, in spite of their long costumes—are equally astonishing. The movements of the men are electric, and their very legs are provocative of sentiment; now compelling your admiration by whirl and poise; now, by rapid inversion of knees and toes, producing an indescribable grotesquesness. Their feats horsemanship are amazing for pace and skill. One member of troup flies along sitting astride in reversed position, another rides upon his shoulder, and a third upon his head, these topsy-turvy adventures calling forth a storm of plaudits; and the leader, not to be outdone, makes the circuit of the arena, alighting and remounting a dozen times while his horse is at full gallop.